Sahaja Yoga is a unique method of meditation based on an experience called Self Realization (Kundalini awakening) that can occur within each human being. Through this process an inner transformation takes place by which one becomes moral, united, integrated and balanced. One can actually feel the all pervading divine power as a cool breeze, as described in all religions and spiritual traditions of the world. This is the actualization of such transformation, which is taking place now, worldwide, and has been proved and experienced by hundreds of thousands in over 90 countries. It is entirely free of charge, as one cannot pay for the experience of Divine Love. 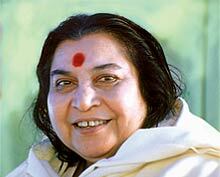 We invite you to experience it yourself - go through a guided meditation session with Shri Mataji. A book about the impact of Self-realization on our world, which despite the intense cynicism of these times, offers the promise and hope of a better future. This book is the story of an encounter with a more than extraordinary woman, a spiritual master with powers of mythical dimension that were revealed in the benign and gracious countenance of someone who appeared to be a diplomat's wife.